OWAcoustic® premium is a quality enhanced mineral wool ceiling product manufactured and marketed under the traditional OWAcoustic® trade mark. It represents Odenwald Faserplattenwerk policy of continued product development and the aim for excellence in the technical qualities of Odenwald Faserplattenwerk products. OWAcoustic® premium is produced in 15 mm thickness in the same variety of measurements, surfaces and designs as previously available. OWAcoustic® premium is eminently suitable for all situations that require good, functional and attractive ceiling design, particularly in those such as offices, hotels, conference and reception areas. It will also meet the particular individual technical requirements of many other various areas of installation. This could, for example, include situations where higher standarts of hygiene are applicable, such as hospitals, clinics and various other types of medical facilities. OWAcoustic® premium will fulfil the highest standarts of technical performance in relation to fire protection, acoustic control and sound insulation. 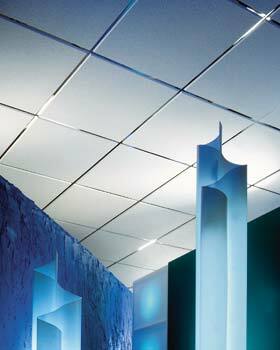 OWAcoustic® premium ceiling tiles are non-combustible A2 according to DIN 4102 and BS476 Pt.4.